COLOGNE, Germany -- Renault SA has chosen Germany's DHL Automotive as its logistics partner for battery distribution as the French automaker seeks to become to the No. 1 seller of electric cars in Europe. 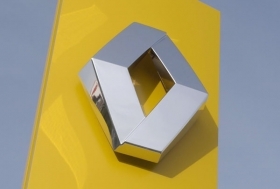 Renault and DHL Automotive agreed that DHL will organize storage and distribution of replacement lithium ion batteries for the automaker's dealers. The three-year deal starts September 1. Pascal Kemps, DHL's global strategy director for automotive, said the introduction of EVs to the mass market brought new logistics challenges, such as using specialized equipment and training staff. DHL was chosen as Renault's partner because it could offer a pioneering pan-European solution in the highly demanding field of specialized logistics for the manufacturing and the aftermarket needs of green vehicles, he said. The company will follow Renault as it expands into new markets with EVs, Kemps told the Automotive News Europe Congress in Cologne, Germany on Thursday. DHL's facility in Bonneuil, near Paris, will become the central warehouse for the distribution of batteries for Renault EVs. The partnership does not include battery logistics for Renault's alliance partner Nissan Motor Co.
Renault is currently launching two EVs, the Fluence sedan and Kangoo small van. The small city car Zoe and the two-seater Twizy are due to follow in 2012. DHL Automotive has 200 automotive facilities worldwide covering inbound logistics to assembly factories, as well as in-plant and production logistics and the aftermarket. Customers including Ford Motor Co., Volkswagen AG and Daimler AG. The company is part of the Deutsche Post group, which last year had sales of over 51 billion euros. The group does not release financial details of individual units. As another part of the cooperation, DHL will add eight more Renault Kangoo battery-powered vans to its road test in the Rhine-Ruhr area in Germany, trialing the operational suitability of electric vehicles for commercial fleet operations.